Changchun City is situated at the heart of Songliao Plains in northeast China, and it''s counties and districts located at 124''18" - 127''02" east longitude, 43''05" - 45''15" north latitude. The total area of Changchun is 20,571 square kilometers, including municipal areas of 2,583 square kilometers, and the municipal constructed area is 159 square kilometers. The city is 250 - 350 meters above the sea level. 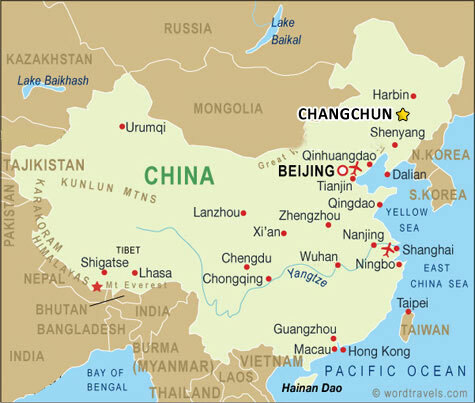 The city stands at the center of the three northeast provinces, and at the crisscross point of the third east-westward "Europe-Asia Continental Bridge". Changchun is a city famous for its culture. As a cradle of China’s auto industry, optoelectronic technology, biological technology and applied chemistry, Changchun is home to a list of well-known research institutes and higher learning institutions including Chinese Academy of Sciences, Changchun Branch; Changchun Institute of Optics, Fine Mechanics and Physics, Chinese Academy of Sciences; Changchun Institute of Applied Chemistry, Chinese Academy of Sciences; Changchun Institute of Geography; Changchun Institute of Biological Products, the Ministry of Health; Jilin University; and Northeast Normal University, etc. Winter is a very special time when all the lakes and rivers turn into thick ice reservoirs. You could not only go skiing, skating and auto rally, but also enjoy the Ice lantern show and snow sculpture display. A participation in the ice-snow festival can be compared to a visit to a fairyland crystal palace. The natural sceneries lie in lakes and forests. Nanhu Park (South Lake Park), Jingyuetan National Forest Park are good places for you to enjoy the pleasure given by nature. Especially in winter the whole city will give you a real enjoyment of genuine winter. The health undertakings of Changchun City are developing rapidly. By the end of 2004, the number of medical care and health institutions had reached 1,642, including 294 hospitals and health centers covering 23,000 beds, a surge of 2.9% from 2003’s record. The number of health technicians had amounted to 34,000, up 7.1% from last year’s record. The number of rural clinics amounted to 1,926, a drop of 2.8% from the record of previous year. The health technicians working at rural clinics came up to 3,992. The number of private clinics had increased to 1,045. The number of professional doctors and professional assistant doctors owned by per 1,000 people had gone up to 2.1.